This residence in Juhu, Mumbai, designed by Rakeshh Jeswaani is a brilliant example of how an understated design can still be eloquent; its inherent simple elegance is artfully balanced with bursts of bright colours and unconventional fun elements. 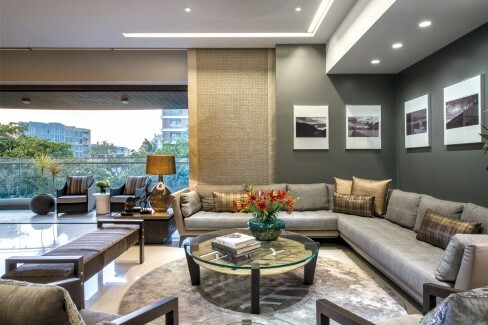 In Juhu, Mumbai, this 3000 sq ft contemporary apartment conceals a paradise within. Spacious rooms and expansive open spaces, both a rarity in urban areas, make this a unique place to design. Describing the client brief, architect Rakeshh Jeswaani says, “The residents of this house are a young couple with two little children. So they wanted a practical and unfussy home that wasn’t flashy. A simple, tasteful home with clean lines and requiring low maintenance.” Designing a residence with an air of unpretentiousness may sound straightforward, but can often turn out to be challenging. To imbue the place with an elegant and unassuming quality and also seeing that it does not look too plain was a challenge. But with a clever execution of nuanced design strategies, Jeswaani has achieved this goal. The colour scheme in the apartment is a modern mix of light and dark grey – most walls are in light grey with some highlight walls embracing a darker shade. In the L-shaped wall behind the living room sofa, the dark grey comes alive with contrasting black-and-white photographs of Ladakh. In the master bedroom and the adjoining TV room, too, it’s used as a background to feature colourful art works. Another requirement from the client was to create beautiful vistas off the terraces, and welcome the greenery inside. Unlike a typical urban residence, this apartment has an enviable 1500-sq ft open area wrapping around its terraces and balconies. “Located on the third floor, it has an inherent advantage of tree lines falling in. With a terrace next to the living room, another next to the master bedroom and two verandas, the house is enveloped by open spaces,” explains Jeswaani. Pops of colours and quirky elements intersperse the earthy feel of the house, rendering a young vibe. At the entrance, a beautifully woven red leather ottoman dazzles against the backdrop of dark smoked oak veneer. A purple wall with a Tanjore painting of Ganesha greets one into the living space. Bright, abstract art pieces all around provide a welcome reprieve from neutral shades. 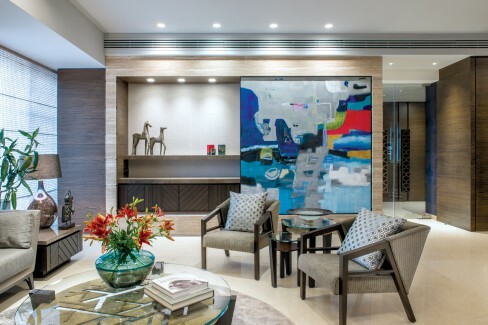 One of the eye-catching elements in the residence is a large art piece designed by Neeraj Patel that acts as a sliding door covering the TV and the bar unit. “As it’s a formal living room, we wanted to keep the TV unit covered when not in use. When the family wants to watch TV, they merely slide the door open,” says Jeswaani. While this is an unusual spot for an artwork, it effortlessly becomes the centrepiece of the house. The light installation from Vibia, a refreshing alternative to decorating walls with paintings, adds a classy look to the dining space. Jeswaani talks about one of his favourite accessories, the light installation from Vibia, positioned adjacent to the dining table. “I wanted the lights to act as pieces of art on the wall on their own. So, I decided not to crowd the wall with any other dramatic piece,” he says. And, these lights certainly bring panache to this space! Another idiosyncratic element in the house is an angular travertine wall in the master bathroom. “The idea was to introduce some unexpected elements in the house, to keep it fun and interesting. This wall, the TV art piece and the lights are examples of that,” explains Jeswaani. The simplicity of the residence is contrasted beautifully with several curated designer furniture pieces. The main sofa in the living room is a plush statement from the Italian brand Roche Bobois. Other furniture items – the round centre table with a textured brass disc and glass surface, the sideboard in the dining room with a beautiful geometric motif and the luxurious beds – are custom designed by Curiosity Furniture. These signature statements of grandeur also blend harmoniously with the theme of the house. A passage from the living space leads to the three bedrooms in the house; the child bedroom has many cutesy knick-knacks with occasional pops of colours. While all these aesthetic elements coming together, the soul of the house is in its cosy corners and green spaces. Our pick is the master bedroom with an adjoining lounge and open terrace. Separated from the master bedroom by a sliding door partition, the lounge has a television, comfy couch and a mini-bar counter, a perfect spot to socialise with friends. 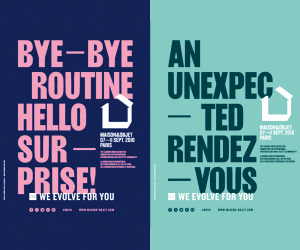 Good design is often considered to be a language. In this charming residence, design is not a fad, not a style; it is instead an unadulterated expression of the people to whom it belongs. That travertine tie wall in the master bathroom must be stunning. I bet it gives the bathroom a spa-like feeling.